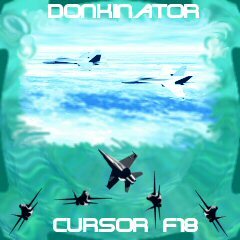 Just a simple jet fighter cursor that I made for myself since I couldn't find one. The craft is modelled in Bryce 5 and most of the development for use in Cursor XP was designed using Paintshop pro and Animation shop. It works really great when you add trails, effects and sound. Had no idea download was broken, lucky I still had the original file. hope it still works since original was for cursor xp. Awesome dude! Is it possible to make more, say an F-14 or an Su-27 Flanker? I'd LOVE to have a Flanker flying around my desktop! Thanks for the nice comments, for my first attempt I am surprised at the number of downloads it is getting. I am honoured. Hmmmm. I really want this file but the link isn't working when I go to download it. Anyone care to post a fresh link to their file for me? Or perhaps even e-mail it to me @ howlin_2004@hotmail.com ? If not then thanks anyway, no big deal. You guys have fun and keep up the awesome work. I like this cursor! The adjustable size and dark colour work for me. Useful in a variety of situations. Thanks! Grateful Flight Simmer here, mucho gracias amigo, Great Work! I like this jet fighter cursor. Thanks!